Bar/prep faucets go beyond the kitchen, to butler's pantries, morning kitchens and more. The pull-down spray wand comes free with a gentle tug and gives you total flexibility. The hose extends and retracts without friction points, fed by gravity. As you raise the wand to dock it, the magnet embedded in the spout pulls the wand precisely into place. So, unlike other pull-downs that tend to droop over time, MagnaTite. keeps your pull-down faucet looking picture-perfect. Delta's exclusive DIAMOND Seal. Technology uses a valve with a tough diamond coating. InnoFlex. PEX waterways keep water inside the faucet out of contact with potential metal contaminants. This powerful combination brings you a faucet built to last up to five million uses. Addison Single Handle Bar/Prep Faucet, Arctic Stainless Bar/prep faucets go beyond the kitchen, to butler's pantries, morning kitchens and more. 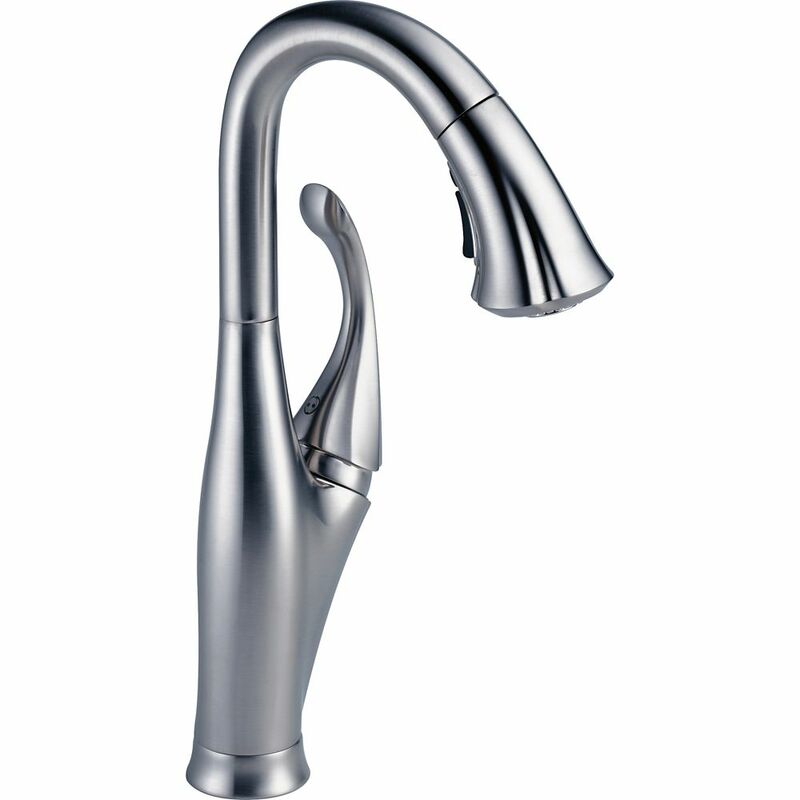 Addison Single Handle Bar/Prep Faucet, Arctic Stainless is rated 4.7 out of 5 by 20. Rated 5 out of 5 by CT from Very happy with this faucet. It looks awesome.... Very happy with this faucet. It looks awesome. Rated 4 out of 5 by JohnSad from I love it very much'!!!!... I love it very much'!!!! Rated 5 out of 5 by none from Yes my husband and I love this faucet. We like the pull down spray and we can turn it 360 degrees... Yes my husband and I love this faucet. We like the pull down spray and we can turn it 360 degrees.IT is a beautiful faucet. like it a lot. We have it for 3 weeks. Rated 4 out of 5 by Anonymous from faucet Very well build. Its easy installation. It comes with two long enough tubes hot/cold supply and cut them to size. The retract works with the weight inserted on the hose. If no obstruction underneath it retract smoothly else push it back manually. Rated 5 out of 5 by MamaWolf from Love my Delta Addison faucet! Just remodeled the kitchen and ordered this faucet sight unseen from the website. I was nervous about it, but I liked the lines and hoped for the best. I absolutely LOVE it! We went from an old two handle chrome faucet from Walmart to this elegant faucet that lends a finishing touch to our new granite countertops and cafe brown composite inset sink. I love the pulldown sprayer, and the high faucet that allows me to fill even the largest pots. I'm now thinking of replacing the old Delta antique brass fixtures in our bathrooms with more Addison fixtures in champagne bronze. I just love the elegant fluting and smooth lines. The faucet reminds me of a calla lily. Great job, Delta! Rated 5 out of 5 by Macky from Very classy. Had this professionally installed. It is really beautiful with the truffle sink and granite; it was a good choice. Easy to use and cleans up great. Rated 5 out of 5 by Stalean from Beautiful Faucet! Just installed the beautiful Addison Bar/Prep Faucet. The faucet looks great on my new island. I wish I had purchased the regular sink faucet for my main sink instead of the Leland, but the Leland is a very nice faucet too. I love the Arctic finish. It looks much better than the older brushed nickel/stainless finish. Home Depot had my purchase to me in about 2-3 days--very good service & price.